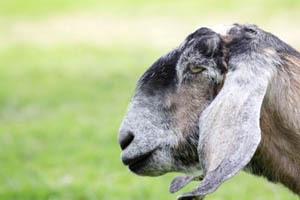 The Nubian is a relatively large, proud, and graceful dairy goat of mixed Asian, African and European origin, known for high quality, high butterfat milk production. The head is the distinctive breed characteristic, with the facial profile between the eyes and the muzzle being strongly convex (Roman nose). The ears are long (extending at least one inch 2.54 cm) beyond the muzzle when held fat along the face), wide and pendulous. They lie close to the head at the temple and flair slightly out and well forward at the rounded tip, forming a "bell" shape. The ears are not thick, with the cartilage well defined. The hair is short, fine and glossy. Any color or colors, solid or patterned is acceptable.